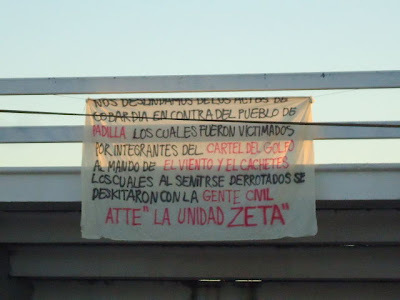 Following the violent deaths of eighteen people in Nuevo Padilla, at least three narco banners, signed by the Zetas, appeared in the capital city of Victoria, Tamaulipas. One was placed two blocks from the State Capitol building, another at the Marte R. Gomez stadium and the third banner was hung near the Crystal Tower. 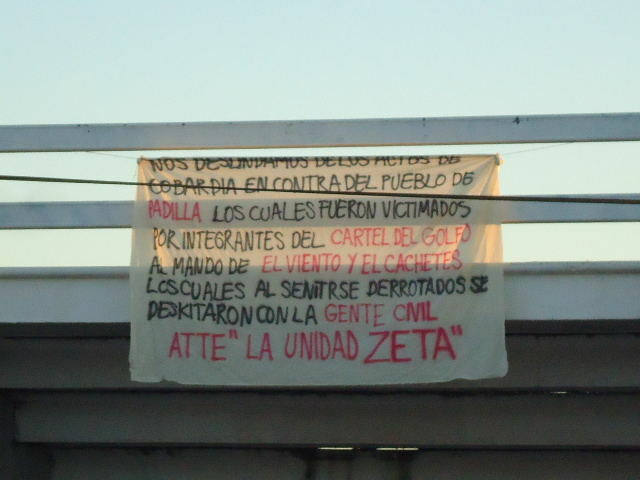 The banners stated the "Zeta Unit", denies all responsibility for the violent attacks which they deemed to be "cowardly acts against the people of Padilla who were victimized by the Gulf Cartel". The banners accuse their rivals, led by "El Viento" and "El Cachetes", of taking their frustrations, due to defeat, out on the civilian population. Does anybody believe any of the BS propaganda cartel,govt, next cartel, in Mexice lying is a finley tuned art even moreso than in the states. I would like to know if its Z3 or Z40's people who signed that manta... And yeah 9:48, no one really takes any banners seriously when they talk about "doing right by the citizens" and all that BS... Narco PR is all it is.